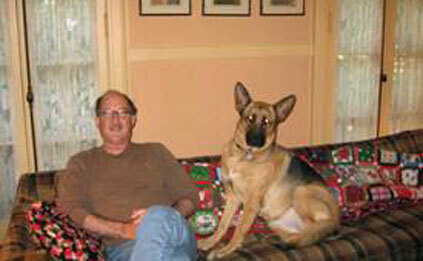 Anja (Formerly Wolfie) Hanging Out With Her Dad! Anja is doing well and in fact, she is on the floor next to me as I type this email. She is a great dog now, but the first two months were not good. At first she was afraid of any loud noise and wanted to hide in the house and would not go out and about in the yard. She sleeps in the kitchen! Everything is wonderful now, it just took a little time and patience. She now patrols the yard and rarely has any concern for loud noise, she has learned to bark! She is becoming well trained, and is great around people. I could not ask for a better dog, Oh and she is learning to fetch. We are interested in getting another shepherd that’s the same size as Anja, but about two years old, especially one that would love to run and play and get on well with Anja.